After leaving the hospital following an illness or injury, most people want to immediately return to their normal routine. There is just one problem: their bodies may not be fully healed or completely capable of performing typical daily tasks. This is particularly true for senior adults. After a hospital stay, many seniors are weak, stiff from lack of movement, and still feel pain. While rehabilitation or physical therapy may be among the last things they want to do, it is often needed to recover as much function as possible. Some of these services can be administered in the person’s home, but a physician may recommend inpatient rehab at a skilled nursing community for safe, medically supervised rehab services. According to Michele Kimball, Senior Director of Nursing at Bethesda Dilworth, rehabilitation in a skilled nursing community begins with a medical evaluation by nurses and physicians specializing in geriatric care. This evaluation includes an assessment of the senior’s medical condition, as well as a review of her or his current medications to establish which are needed and which are not. Also, the individual nutritional needs of the senior are determined and provided for by in-house registered dietitians. Many seniors are hesitant about rehabilitation therapy because they believe they’re past their prime. The truth is, no one is too old to benefit from physical therapy. Physicians recommend it because it has proven to be an effective part of a person’s recovery. If a senior has been released from the hospital after a fall, statistics show they are more likely to fall again. Therapy is necessary to strengthen the body and improve balance to help prevent this from happening. After prolonged disuse, joints and muscles stiffen and weaken. Mobility decreases while pain increases. Endurance, flexibility, and strength can be regained, and pain can be relieved under the guidance of a physical therapist. The training and exercise in physical therapy sessions also help alleviate the symptoms of arthritis and control some of the effects of osteoporosis, a progressive bone disease that reduces bone density. Therapists can offer alternative methods to complete daily tasks. Most importantly, as the senior progresses in therapy and begins achieving more goals, her or his self-confidence grows. 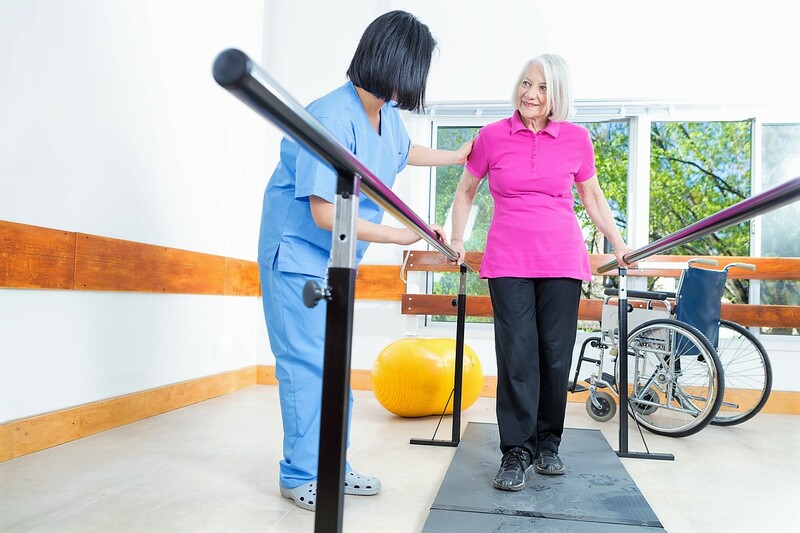 Studies show that long after completing physical therapy, it still provides benefits in terms of strength, endurance, and balance; benefits that can enable seniors to remain independently in their homes longer. People often think of rehabilitation services after a fall or broken bone, but the results of the service expand much wider for seniors. Speech therapists help with speaking skills and difficulty in swallowing. According to Michele, the breathing exercises speech therapists use can prevent a reoccurrence of pneumonia and subsequent re-admission to the hospital. Occupational therapists work to increase a senior’s range of motion, which improves their ability to perform daily tasks. Seniors decline rehabilitation for a variety of reasons. If inpatient rehab is recommended, seniors who were hospitalized may not want to be bothered with any more treatments outside their home, and they may not understand the basis for the therapy. Not only can this can be frustrating for caregivers, but declining recommended rehab can lead to permanent loss of function and diminished quality of life for the senior. Therefore, it is important to explain why therapy and rehabilitation are needed. It may help to include the senior’s physician in the discussion. Fear may also be an issue. Seniors may ask themselves if rehab will be painful, or if they will ever return home after rehab is over. Caregivers must explain that the therapy is temporary and an important part of the healing process that should not be skipped. Sometimes seniors are more open to outpatient therapy, as it offers more independence and time at home. However, this may not be the best option for a senior’s condition. If this requires multiple trips to and from an outpatient rehab center, caregivers should point out it would be best to receive therapy on an inpatient basis. As hesitations arise, assure the senior that their home will be taken care of in their absence. At Bethesda, we understand the physical and emotional needs of seniors receiving therapy and rehabilitation services following hospitalization. If your senior loved one has recently suffered an injury, please contact us for more information about our senior rehabilitation services.